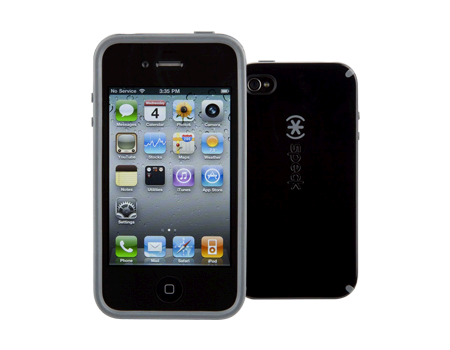 Protect every side of a cell phone with the Speck CandyShell for iPhone 4 and 4s, which features a silicone inner layer, hard outer shell, and screen protector. Your iPhone 4 or 4S will sigh with relief when you encase it in the glowing colors of CandyShell – a scrumptious confection of style and protection. You get a sweet dual-layer defense system with a hard outer shell and a soft, rubbery, shock absorbent center. Choose a color to reflect your mood or fashion. Raised bezel guards against screen nicks and scratches and rubberized covers shield buttons and controls. Slides in and out of pocket or purse with ease.